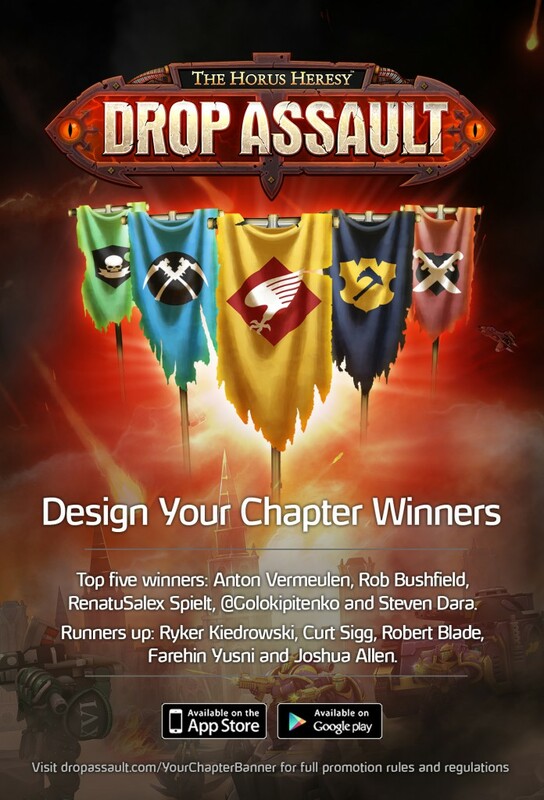 A few weeks back, we invited our fans to submit the designs they’d like to see on their chapter banners in our Design Your Chapter contest. We received a lot of incredible entries! After much deliberation, our panel of judges selected five winners. But it doesn’t stop there. They were so impressed with the caliber of entries that they decided to select an additional five runners up. The top five winners are Anton Vermeulen (Thunder Warriors), Rob Bushfield, RenatuSalex Spielt (Golden Fists), Twitter user @Golokipitenko and Steven Dara. Congratulations! Five runners up are: Ryker Kiedrowski, Curt Sigg, Robert Blade, Farehin Yusni and Joshua Allen. Congratulations! Our top five winners, in addition to having their entries appear in-game, will receive a Machine Spirit Sepulchre. Our runners up will also see their designs appear in-game, and will receive 100 Machine Spirit. Stay tuned for more contests and giveaways coming soon!